It’s hard to believe that just a few months ago we were offering up some summer activities that were both family-friendly and back-friendly! If you’re like us, you’re probably wondering where the summer went. But never fear! Just because winter is coming, doesn’t mean you have to sit inside all day. In fact, as tempting as it is to make some popcorn and put on a movie, prolonged sitting can actually wreak havoc on your back. We’ve taken the liberty to offer a few winter activities that are easy on the body. At Marshall’s Creek Wellness Center, we want you to stay active all winter long. If you’re having trouble getting out and about, you might be interested in our chiropractic services or massage therapy. 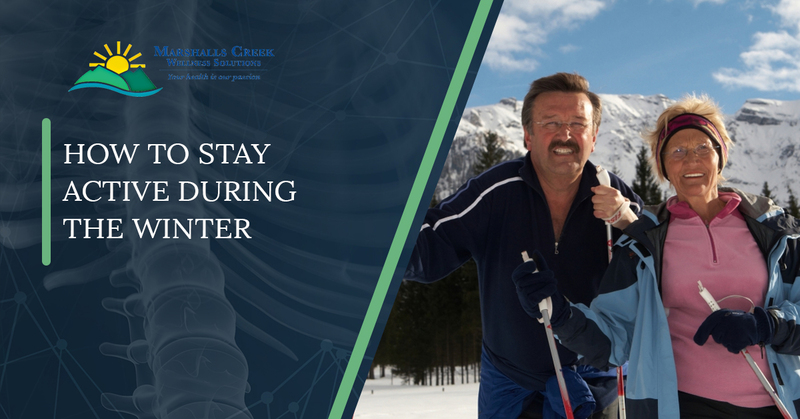 Don’t let aching joints and sore backs ruin the fun this winter. Even “bad backs” can benefit from regular use, so get up and get moving with the help of Marshall Creek. Contact us today to schedule an appointment. Without further ado, here are eight fun activities the whole family can enjoy this winter! Go for a hike: Stroudsburg and the surrounding areas are full of awesome hiking areas. Winter hikes are a great way to get out and moving without doing anything too strenuous. Put on the jackets and boots, grab the dog, and hit the trails with the family. Try snowshoeing: If you can walk, you can snowshoe. Snowshoeing is a low-impact, aerobic exercise that is relatively inexpensive compared to skiing or snowboarding. Bake some sweet treats: Can’t stand the cold outside? That’s still not an excuse to lay around all winter. Head to the kitchen and bake your favorite winter treats. Whether you’re making an apple pie, gingerbread men, sugar cookies, or your favorite Swiss roll, baking is a good way to pass the time – and get a yummy snack out of it. You’ll be doing lots of standing at the kitchen counter, so be sure to wear some supportive footwear. Spend time in a hot tub: Cold weather can be hard on our joints. Spending some time in a hot tub is perfect to warm up cold joints and soothe an aching back. This is also a perfect time to enjoy the company of friends or your spouse, or grab some popsicles and invite the kids! Collect pinecones: During this time of year, pinecones are abundant all over the forest ground. Grab a grocery bag and get outside and collect them. Once back at your home, allow the pinecones to dry out and use them as decorations throughout fall and winter. To make these normal pinecones a little fancier you can roll them in glue and cover them with glitter or use a metallic spray paint to give them a nice shiny coat. Do a jigsaw puzzle: Okay, we know we’ve been telling you to not do activities that involve a lot of sitting, and you’re probably wondering why a jigsaw puzzle is on this list. Let’s be honest – a big jigsaw puzzle starts off as an innocent table-top project with everyone sitting neatly in chairs, but after ten minutes, you’re usually out of your seat, scanning the table for that last edge piece, and grounding any kids who block your lighting – okay, maybe not that last one. This is another ideal indoor activity that’s lowkey and simple and doesn’t involve staring at the TV. Just make sure not to hunch over the table too much – your chiropractor will know if you do! Spend the day at a soup kitchen: Want to get out of the house without being out in the cold? Volunteering at a soup kitchen is a great way to give back to your community and stay active. Many soup kitchens and homeless shelters allow kids to help volunteer, so don’t hesitate to make this a family affair! Build a snowman: If your kids are fans of Disney’s Frozen, asking them, “Do you want to build a snowman?” might result in a boisterous sing-along. Building a snowman is a classic tradition that many adults perfected in their youth. Now it’s time to teach your kiddos everything you know about making the perfect snowman. While it’s completely fine to relax on the couch and watch a movie, as with most fun things, moderation is key. Take a few weekends this winter to engage in some of the above activities. If you need some extra encouragement, our wellness clinic offers health and lifestyle coaching along with our physiotherapy and chiropractic services. Take a few minutes to check out our services, and contact us today to make an appointment.